Custom made to order. Ships 2-3 weeks after you order. 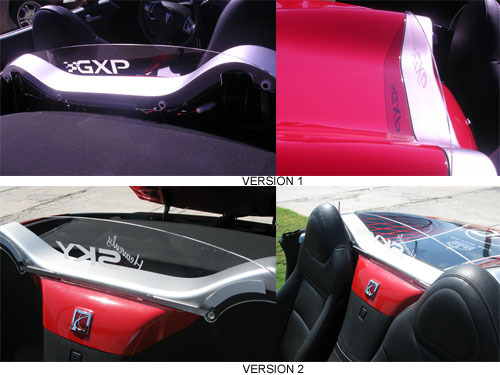 Our made-in-the-USA Wind Restrictor is an amazing, unique and durable product that blocks as much (or more) wind turbulence than the factory OEM mesh net windscreens and helps to maintain the temperature inside of your roadster when the top is down. All of the Wind Restrictors we offer can remain in place with the roof closed and are mounted solidly yet inconspicuously without any permanent alterations required. The Wind Restrictor is designed to significantly reduce back draft. Back draft is created when wind pressure inside your car's cabin is less than the wind pressure outside the car. The cabin acts as a vacuum and gusty wind enters from behind the passengers, creating noise and buffeting. The WR will block this wind from entering the cabin at highway speeds. You can control the amount of wind by adjusting the side windows. The lower you put your side windows, the windier it will be inside your cabin. Put them up completely to reduce wind as much as possible. Made from double-sided AR Polycarbonate This very durable acrylic type material is also scratch resistant. Others are made out of much cheaper materials and dangerously breakable plastics. Some are Lexan: the disadvantage is that it scratches easily and won't emit illumination and may also discolor with etching. Professionally and precisely designed and laser cut Others are produced at home using table routers and jigsaws leaving rough edges and defective shapes. Wind Restrictors are professionally produced from the finest materials using state-of-the-art equipment. Illumination available The only wind deflecting device on the market that has this patent pending feature! You can have the Wind Restrictor Light Kit hard wired to any 12 volt wire in the car. Most car audio/electronic shops or dealerships can wire it or you can do it yourself in less than 1 hour. A cigarette lighter plug adapter or AAA battery pack can be added for an easy, convenient connection. Perfectly formed to the contours of your roadster Others are not designed or manufactured to fit the body lines or roll bars on your roadster. Attaches to your roadster without permanent alteration or tacky fixtures No drilling of holes, adhesive tape, Velcro or straps. Easy installation 1. Remove 2-4 screws from your rear panel 2. Mount the Wind Restrictor into place 3. Put extended screw connectors back in place! Total installation time is about 5-8 minutes. Version Options: Version 1 mounts with 4 replacement screws on the back side of the rear silver panel. No drilling is necessary (the screws replace shorter screws already in place). We suggest removing this version if you are leaving your top up for extended periods of time (such as winter storage), but it can be left in place for daily use and while the top is either up or down. 1/8" thick. Version 2 mounts above waterfall compartment to the front side of the silver panel with dual-lock fasteners. No alterations or damage whatsoever to your vehicle. Dual lock fasteners can be removed later without any remnants. Can be left in place with top up. No drilling necessary. Mounting points are hidden when installed. 1/4" thick. Extreme Lighting Kit: With our new Extreme Lighting Kit, you can choose which color you want your Wind Restrictor to light up in - no longer do you have to choose a pre-defined color. Choose from red, white, blue, pink, yellow, green, or cyan any time you wish. The unit comes with a remote control that you can use to turn the lights on or off or change the color. The controller features a cool "fade" option and also a "blink" option for use at car shows or gatherings. Requires a 12V plug and can be either hardwired or used with a 12V outlet in your car for maximum flexibility. We assume you're here because you're looking for something to block the wind in your car. There are a lot of names people might use to find such a device, words like wind screen, wind deflector, wind stop, wind blocker, wind block, etc. Hopefully you found us and like what you see. These are awesome, show-stopping wind blockers that do a lot more than just help you stay un-breezy. The end result is a pretty nice effect. The product does not disappoint in its ability to "restrict" the wind that comes into the cabin of the car. With the windows up and the roof down there is a very noticeable difference. The installation directions are not as precise as I needed them to be, so there was measuring and remeasuring required. However well made the product is, it is made of acrylic and has a slight bounce while traveling at and speed. Over all I really like the product and am happy to have it in my car. Very easy to install all instructions complete with exact pictures. Only the light was a nucinc connector to get to tuck in the panel joint . Over all very satisfied . Would do business again in future. Love it! Not only does it help with wind it looks really sharp on the car. The online chat customer representative steered us in the right direction on this purchase! This works very well. I put a little extra and where the Restrictor mounts I put 2 machine screws through the bracket to the car frame to cut down the vibration. Installing the light bar has many options. I like the looks of the restrictor, mine is clear. I have had the screen type of restrictor on a 2007sky. I believe it was more effective in blocking the wind from drafting back into the cocpit. I believe if the screen was a bit taller it would work better. I am only five six so someone taller would get even more wind. I will be replacing this one soon. Not sure with what.